LogFusion is a free and professional realtime log monitoring software for Microsoft Windows designed specifically for administrators and developers. Most client and server operating systems, and many services, and programs create log files. Windows creates log files for a lot of events for instance, and web servers for instance for hits and errors. Most logs are stored as plain text files that may be opened in any program supporting these standard file types. Specialized log management software on the other hand is usually better suited for this thanks to an advanced set of features. Features such as advanced filtering and parsing, synchronization, or the highlighting of lines are usually not found in plain text editors. LogFusion Free is the free version of LogFusion. It is available as a portable version and a version that can be installed on Windows machines. The free version is powerful but limited when it comes to some features. You can check out the detailed comparison on the developer website. Core features that the free version lags are support for watched folders, log categories, and a tabbed interface for view multiple logs at the same time in the interface. Pro versions of LogFusion start at $9 however, and the only difference between the Pro versions is the number of devices that the license is granted for. The interface of LogFusion may not be the prettiest, but it is functional. You can hit the open file button to load a log file in the application. The program supports all plain text log file types, and will parse the log when it is loaded. 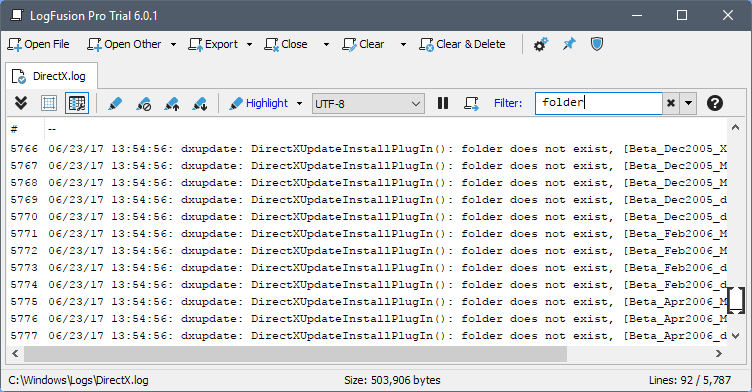 LogFusion supports different file encodings, including UTF-8, UTF-16 and UTF-32. You may load local logs, or use the "open other" button to load event channels or logs, or remote events or logs instead. The program lists all event channels and logs in its interface when you select the option, so that you can select them right away. Note that the program limits log lines to 50,000 by default. You need to open the settings and there log settings to change the number of loaded log lines. Line numbers are added automatically for easier navigation, and auto-grid and auto-size features improve the listing further. The application will load new updates automatically by default. You may disable that temporarily with a click on the pause button in the interface. The free version of LogFusion supports text-based searches to filter log files based on your input. You can double-click on any row to display all of its information in a new window. This may improve the accessibility, especially since you can use it to open multiple log lines independently of the main interface. The program comes with a highlight feature. This is somewhat limited in the free version, as you cannot make use of row highlighting based on custom text matching or regex matching. LogFusion comes with export functionality. The program supports the exporting of selected log file rows or the entire log to CSV or HTML files. LogFusion Free is a professional log management software for Windows. The free version is good for the occasional analysis, the pro version more suitable for users who work with log files regularly. nevermind it is not as dbgview, seems quite good. i bought it. I use Lister for log files viewing, but I guess I’ll give this one a try. Always a pleasure to read your blog, Martin. Old stuff, but fast, simple and still working after various Windows versions. I’ve been using Trace32 for years (included in MS SCCM) for tailing log files, always good to see other options.